For 89 years, a dam blocked salmon on the Eklutna River. It’s finally gone. With a massive hurdle to fish passage in the Eklutna River now gone, it's up to local utilities to take the next step toward restoring the river to its natural state. 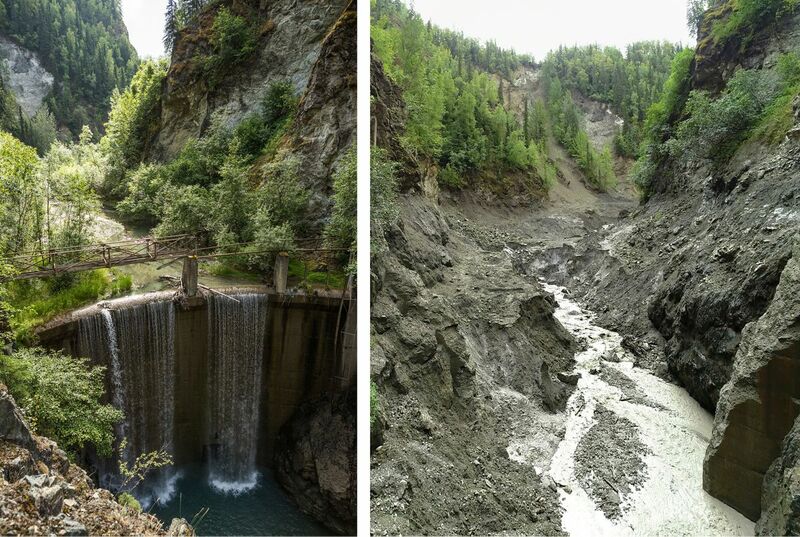 In the first week of August, a yearlong project to remove an abandoned diversion dam in the Eklutna River Valley was completed. Although the dam removal hasn't restored water flow into the river, it's a major step toward returning the 22-mile stretch of prime salmon habitat to its natural state. Gone is the massive crane used to remove the 61-foot concrete dam, as well as hundreds of thousands of cubic yards of sediment that had accumulated over more than six decades of neglect. "The dam's removal is fully complete and we're pretty psyched about that," said Brad Meiklejohn, Alaska state director for the Conservation Fund. The nonprofit Conservation Fund raised $7.5 million to fund the project, which had the support of landowner Eklutna Inc. In 2015, the Native Village of Eklutna and Eklutna Native Corp. joined with Meiklejohn's group to start the process of returning the river's flow, and the dam removal itself got underway in the spring of 2017. The diversion dam was built in 1929 to provide hydroelectric power to Anchorage, but it was abandoned in 1955 when a new earthen dam was installed near the lake. Since then, the concrete structure has held back a trickle of water coming from small tributary streams; lake water behind the main dam is used to power the Eklutna Power Plant and supply drinking water to Anchorage residents. According to the municipality, Eklutna Lake supplies 86 percent of drinking water to Anchorage and Eagle River. A 40-megawatt hydroelectric plant near the Knik River is the terminus of a 7-mile tunnel that drains water from the lake that then turns the turbines at the plant alongside the Old Glenn Highway. The removal of the diversion dam is just the first step toward what Meiklejohn hopes is a comprehensive restoration of the river, which historically supported large runs of salmon. Although the removal isn't an overnight fix, Meiklejohn said its impact could be seen as soon as this fall. "For the first time in 88 years, we could begin to see silver salmon moving up past the old dam site this fall," he wrote in an email to the Anchorage Daily News. "There is still a lot of sediment washing out of the former dam site, so it will take a while for water clarity to improve and be attractive to fish." But although the dam is now gone, the river remains but a shadow of its former self as the lake's water is still diverted for other uses. "What comes next is making sure some more water flows down that river," Meiklejohn said. Under the terms of an agreement with the federal government, the dam's owners — Municipal Light & Power, Chugach Electric and the Matanuska Electric Association — must begin to study how to mitigate the impacts of the dam on fish and wildlife populations by 2022. The utilities agreed to the deal in 1991, when they were in the process of purchasing the dam from the Alaska Power Administration, the federal agency that formerly managed the dam. By 2027, the dam's owners must begin implementation of a mitigation plan, and work must be completed by 2032. No water from the lake currently makes it into the Eklutna River, whose flow is now made up of water from Thunderbird Creek and other small tributaries. Meiklejohn wants that to change. "It's been 88 years now and we think it's time for the fish to have their water back," Meiklejohn said. For that to happen, the utility companies must begin the process of studying the impacts of the dam and creating a plan to restore habitat. Due to the terms of the agreement, that process doesn't have to begin for another four years. But Meiklejohn hopes it starts sooner. "We've just spent $7.5 million to fix a mess that someone else created," Meiklejohn wrote in a follow-up email to the Daily News. "We didn't do that to have a dry river; we did that to jump start the full recovery of the Eklutna River." On Friday, a spokesperson for the utilities said they're committed to starting the process before the deadline. "The Eklutna Hydro Project owners (CEA, ML&P and MEA) have informally agreed to begin the process for the impact studies earlier than required and are in discussions to finalize our timeline and next steps," said Julie Estey, an MEA spokesperson speaking on behalf of the Eklutna Hydro Project owners. At an August meeting of the Anchorage Assembly ML&P general manager Mark Johnston said the loss of hydropower could result in rate increases, and figuring out how to mitigate the impacts of the 555-foot earthen dam holding back Eklutna Lake won't be easy. "The bottom line is there are a lot of unknowns," Johnston said. In October, the assembly passed a resolution urging the utilities to begin the process of studying "the impacts to fish and wildlife of Eklutna Lake and Eklutna hydropower operations" as soon as possible. In its resolution, the assembly cited the presence of all five species of Pacific salmon in the Eklutna River "though in diminished numbers from historical levels." In addition to assembly support, habitat restoration has the backing of U.S. Rep. Don Young. In an Aug. 6 letter Young sent to MEA general manager Tony Izzo, the congressman said he's hopeful water can begin flowing into the river sooner rather than later. "With the lower dam removed it is now time to find ways to restore normal water flows to the Eklutna River," Young wrote. "I encourage you to begin this work. As someone who had a hand in the divestiture of the Eklutna Power Project, I am keenly interested in seeing the timely restoration of the Eklutna River and the recovery of the salmon for the benefit of the Native People of Eklutna. Restoring healthy salmon runs in the Eklutna River will benefit a great many Alaskans who live in Anchorage and the Mat-Su Valley." Meiklejohn hopes public pressure will spur the utilities to act as soon as possible. "I'm cautiously optimistic," he said. "I think there's enough voices supporting this saying this is a priority for our communities and something folks want to see happen." Correction: An earlier version of this story misstated the power output of the Eklutna Lake hydroelectric plant. It's 40 magawatts, not 40 watts. It incorrectly stated power utilities purchased both the Eklutna Dam and the old Eklutna Diversion Dam in 1997. The utilities only purchased the new dam, not the recently demolished diversion dam. Also, the story misstated the name of the Alaska Power Administration, the federal agency that previously managed the power plant.